When arriving six months ago, it was middle of summer, we obviously started to look for a house. One of the requests for the house was (floor)heating. The real estate people just looked at us as if we were crazy and said “We don’t need heating in our houses, it is warm enough”. Well, I can tell you, that is a big lie. June and July are the winter months in Johannesburg. At night it gets around 0 *C and during the day around 15 *C. The days are beautiful. Crisp air, bright blue skies, the sun it out. It feels like a very nice day in the mountains (for everyone who has been fortunate to go for a skiing trip, you know what I mean). I can even say, I have missed these crisp days. It makes you happy, or at least me, and energetic to go out and do stuff. But at night it is a different story. Not many people go out, they snuggle up on the couch with blankets, thick socks and tea or wine. And a gas heater, you can not live without a gas heater. Because there is no central heating in South Africa. And no double glazed windows, nor isolation on roofs or floors. Basically it gets really cold inside the house when it is cold outside. Luckily someone told us well before the winter arrived that we needed to buy at least two cilinders of gas for the heater because they will run out of cilinders once the cold has come. Isolation and green energy is not a big thing yet in South Africa, so we just do what every South African person is doing during these cold days. Cuddle up on the couch with another wool blanket, gas heater, wine and stew or tea and home made muffins. We make a hot water bottle before going to bed, take a hot shower, put a Sotho blanket on our double duvet and curl up. In about 1,5 months it will be nice and warm again. 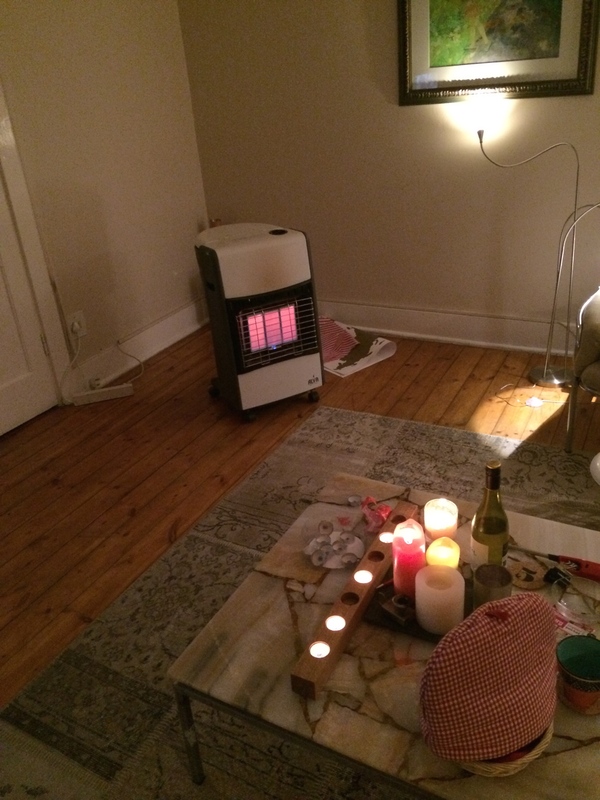 Gas heater, candles and tea.